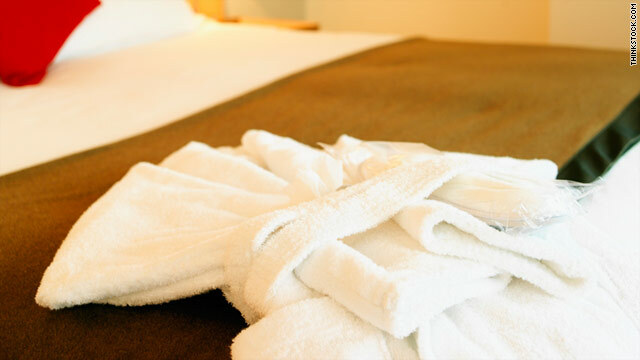 Linen Technology Tracking recently patented a chip designed to track bathrobes, towels and sheets. (CNN) -- Hotel guests, be warned: Your bathrobes may be under surveillance. Linen Technology Tracking, a Miami-based company, recently patented a radio-frequency identification chip designed to keep real-time inventory of frequently misplaced or stolen goods. Three hotels -- in New York, Miami and Honolulu -- now use Linen Trackers, said William Serbin, the company's executive vice president. "After being in the industry for many years, I understand the challenges hotels face in monitoring linen," he said. "Any given month, they can lose 5 to 20 percent of towels, sheets and robes. That gets expensive with the rising cost of cotton." Beyond policing freebie-hungry travelers, the chips help managers properly stock rooms and order supplies. "Keeping track of everything is an arduous task, and there's never been a clear system," he said. "The chips introduce accountability, make things easier." It was an idea he considered when driving Florida's toll roads. Sensors, a widely used automatic technology, made sure everyone paid and maintained order. Serbin pondered: How do we take a similar concept and make it waterproof? "We tweaked the technology, went through trial and error with different types of chips and put them in the correct place," he said. "Now, chip life exceeds 300 wash cycles." And it works, Serbin said. Trackers have busted several robe and towel thieves, who were politely asked to return hotel property. "It's been phenomenal," he said. "The chips create a lot of conversation. When my friends travel, they'll call and ask, 'Are you guys at my hotel?' "